The HSM SECURIO P44 1870 is a 3.9mm Strip Cut shredder and the Highest Capacity Departmental Shredder on the Market today. The machine is a Mobile, High performance model designed for entire Departments and Large Office Floors. It has a strip cut security level of P-2. For High Security Level 5 and 6 please see the SECURIO P44 HS. The HSM SECURIO P44 1870 is supplied with a unique Multi-function operating button which controls all functions of the machine plus a reversing button and integrated button lock. In the event of a jam the unit auto-reverses. A special folding safety element with contact protection and integrated service flap ensures safety to the operator. The HSM SECURIO P44 1870 machine is made in Germany and is very simple to use. Simply select the different functions with a single control key: start, stop, temporary and permanent mode. In the event of a paper jam, the reverse function starts automatically. With a quiet operating sound and attractive functional design, the HSM SECURIO P44 1870 fits into any style of office without disturbing the operator. The model is supplied complete with the EMCS (Energy Management and Control System) which automatically switches to energy-saving mode after 2 minutes of being idle. 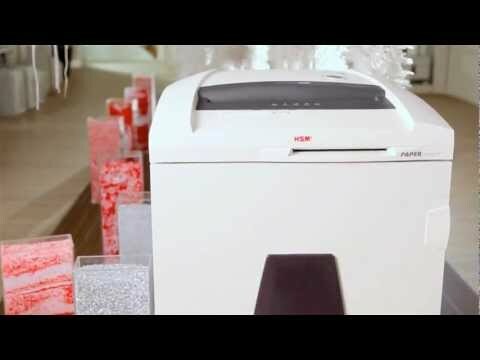 If you then feed the shredder with paper (within 1 hour), it will automatically switch on again. For CD/DVD Media Destruction to Security Level 3 choose the SECURIO P44 + CD Cross Cut model.